Michelin LTX M/S2 tires are Michelin’s number one selling light truck tire, and there’s no secret to why that is once you have the opportunity to drive on it. 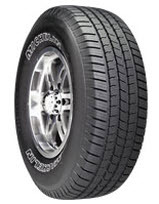 Not only does this tire provide a high level of performance, but based on tests from independent parties, the Michelin LTX features a tread life that lasts up to 20,000 miles more than the Bridgestone Dueler HT 684 II and Goodyear Fortera TT. The tire itself sports a symmetrical tread pattern and a tread compound that is silica enhanced to go along with Michelin’s MaxTouch Construction. This unique design gives the tire a more rounded shape that makes for optimal tire contact with the road surface. It ensures more even tire wear and much better acceleration, handling and braking performance, as well as a quiet and comfortable ride. All-season traction is improved by Michelin’s use of larger independent tread blocks and 3D sipes that combine to provide enhanced dry or wet pavement handling and cornering. When it comes to wet roads, the Michelin LTX has four circumferential grooves and a number of lateral grooves that evacuate more water from under the tire. What that means for you is better overall traction in accelerating and stopping, and much more confidence behind the wheel. Inside the LTX M/S2 you’ll find twin steel belts that are nylon wrapped for added stability at higher speeds, while also giving you the strength you need when handling heavier loads. Overall, the Michelin LTX M/S 2 provides exceptional performance regardless of road conditions. The ride on this tire is very comfortable and you won’t hear any noticeable road noise. Add in a 70,000 mile tread life and you have a tire at the top of its class. Who Are Michelin LTX M/S 2 Tires Designed For? Michelin has designed the LTX M/S 2 tires for drivers of all types of pickup trucks, vans, SUV’s, Crossovers and even commercial vans and shuttles who are seeking a tire that provides excellent performance in all road conditions, as well as a comfortable ride and long tread life. Michelin backs up the LTX MS2 with a 6 year or 70,000 mile tread life guarantee, which is excellent for a tire in this class. Uniformity of the tire is warranted for the first year or first 2/32 inch of wear. Materials and workmanship are guaranteed 6 years and include free tire replacement during the first year or first 25% of wear. Michelin prorates out the amount for the remaining time period or until the tire has less than 2/32 inch of useable tread left on it.